Hantavirus infections have an incubation period of approximately 2–4 weeks after transmission and an effective immune response has usually already developed at the onset of symptoms, including high levels of specific antibodies. This makes the diagnostics of hantavirus infections rather straightforward; usually the diagnosis or exclusion of hantavirus infection can be achieved by a single measurement of hantavirus-specific IgM antibodies. 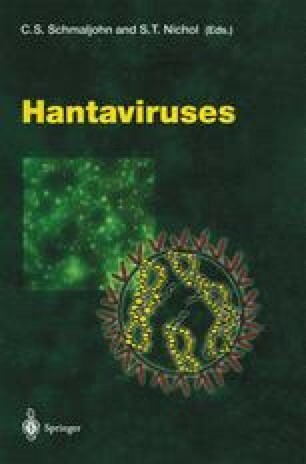 However, cross-reactivities (or the lack of them) between hantaviruses should be taken into consideration when choosing the right antigen in a given geographical area, or when interpreting the exact infecting agent. In addition to being helpful for diagnostics, the coinciding onset of symptoms with the immune response together with early presence of various cytokines,inflammation markers, and activated T-cells in peripheral blood and in, e.g., infected lung endothelia, has prompted researchers to seek immunopathogenetic mechanisms for the disease. Such mechanisms are further supported by the association between certain human lymphocyte antigen (HLA) haplotypes and severity of the hantavirus disease.